What Happens When Your Biotech Stock Faces Generic Competition Lawsuits? Death, taxes, and generic competition are certainties in life. Panicking is not the best response. Few things are as inevitable and frustrating as generic competition in the pharma industry. After overcoming the high risks of failure in drug development and pouring money into sales and marketing, the owner of a successful drug can see its revenue plunge overnight when generic copycats come onto the scene. Mind you, this is how the system is supposed to work, and lower-priced generics can be incredibly beneficial to patients (which is the reason the industry is supposed to exist). However, the encroachment of generic competition is often coupled with lawsuits and legal challenges, which can be scary and confusing for investors. The good news is that most lawsuits are the result of structural inefficiencies within the patent system -- hardly something to panic over. The bad news is that there are always winners and losers. That will lead to make-or-break outcomes for companies currently embroiled in high-profile patent lawsuits, such as United Therapeutics (NASDAQ:UTHR), Teva Pharmaceutical Industries (NYSE:TEVA), and Momenta Pharmaceuticals (NASDAQ:MNTA). United Therapeutics, which specializes in developing and providing treatments for chronic and life-threatening conditions -- specifically, the lung and heart condition pulmonary arterial hypertension -- is down 13% in the last year as investors begin to quiver in fear over a potential onslaught of generic competition in the coming years. The company is currently fighting off generic competition from Par Sterile Products for its leading drug, Remodulin; Watson Laboratories for its No. 2 drug, Tyvaso; and Actavis for its fastest-growing drug, Orenitram. There are also settled disputes with Sandoz and Teva Pharmaceutical, which will begin to market generic versions of Remodulin in June 2018 and December 2018, respectively. It doesn't look pretty, but the lawsuits being thrown at United Therapeutics are par for the course. Consider that generic competitors can file notices saying they intend to offer generic medications before the patents expire on innovator drugs by contesting the validity of the patents. Whether the allegations are true or not, the owner of the innovator drug -- in this case United Therapeutics -- has 45 days to respond. A response prohibits the FDA from approving a generic drug for at least 30 months, or until a district court decides the patent infringement case. If the patents are upheld, then the innovator drug can enjoy exclusivity until they expire, which can be longer than 30 months. For instance, the company's last patent on Tyvaso, being challenged by Watson, expires in December 2028. Another quirk of the regulatory system to consider: Generic-drug manufacturers are actually incentivized to challenge patents before they expire. That's because the first generic manufacturer to file for approval with the FDA gets to be the only generic marketer of the drug in question for six months. In other words, it gets to offer a generic drug at prices only slightly below that of the innovator drug. To achieve that, sometimes the challenger needs to throw a wrench in the monopoly provided by patents before they expire. It's a purely financial play that, while not guaranteed to work, can have big upside for a generic manufacturer. Newcomers aren't the only ones that hire lawyers. Sometimes the owner of an innovator drug needs to file a lawsuit against a generic manufacturer that it believes is infringing on a patent. Momenta Pharmaceuticals was on the wrong side of the coin in 2011 when its best-selling and patented drug, enoxaparin sodium injections, faced generic competition from Amphastar and Actavis. It sued the competitors for infringing on its patents, but a slow and drawn-out legal dispute couldn't keep sales from sliding. After notching $260 million in product revenue in 2011, the company has managed just $58 million through the first nine months of 2016. MNTA Revenue (TTM) data by YCharts. That could soon change. In June 2015, Momenta and its partner Novartis launched a generic version of Teva Pharmaceutical's Copaxone, a drug that treats multiple sclerosis. Copaxone had two formulations: once daily and thrice weekly. The former lost patent protection in summer 2015, while the latter, which now makes up 78% of the market, is protected by three patents that expire in 2030 (if they're valid). Teva Pharmaceutical sought to protect its turf and its $4 billion drug franchise by suing Momenta and Novartis, which had filed for FDA approval of a generic version of the new formula. But the move may have backfired. A court struck down two of the patents in August, while a decision on the third will be announced in the first quarter of 2017. If that is also found to be invalid, then Momenta and Novartis could find significant room to run by offering a generic version for both once-daily and thrice-weekly Copaxone. Investors can never be certain that generic competition lawsuits will be decided in their biotech stock's favor, but they shouldn't panic when lawsuits are disclosed. 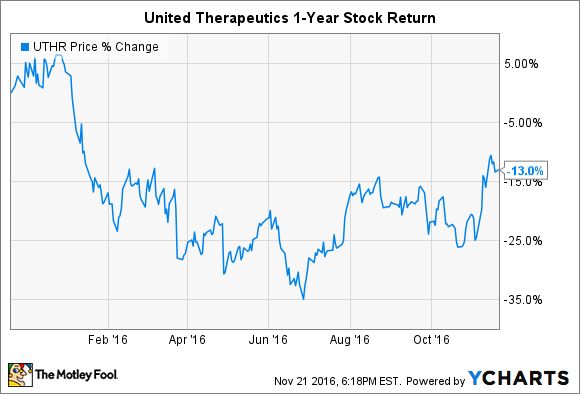 While generic competition is a real threat for United Therapeutics, I think the risks are overblown. The company is currently expecting FDA approval for up to seven new products and/or indications by the end of 2019. Another three are expected by the end of 2020. 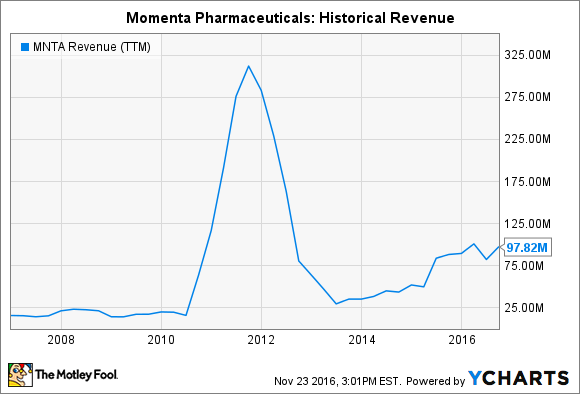 Meanwhile, Momenta Pharmaceuticals is hoping that it can be on the winning side of a courtroom battle as the generic disruptor to Teva Pharmaceutical's Copaxone. History shows that it could go either way, but investors will need to await the court's decision early next year.